Definition at line 65 of file tab.c. Definition at line 28 of file tab.c. Definition at line 37 of file tab.c. Definition at line 38 of file tab.c. Definition at line 30 of file tab.c. Definition at line 31 of file tab.c. Definition at line 33 of file tab.c. Definition at line 34 of file tab.c. Definition at line 29 of file tab.c. Definition at line 35 of file tab.c. Definition at line 76 of file tab.c. Definition at line 41 of file tab.c. Definition at line 48 of file tab.c. Definition at line 224 of file tab.c. Referenced by test_removeimage(), and test_tab(). Definition at line 402 of file tab.c. Definition at line 362 of file tab.c. Referenced by test_adjustrect(), test_curfocus(), test_cursel(), test_delete_focus(), test_delete_selection(), test_extendedstyle(), test_getset_item(), test_getset_tooltips(), test_insert_focus(), test_TCM_GETROWCOUNT(), test_TCM_SETITEMEXTRA(), test_TCN_SELCHANGING(), test_TCS_OWNERDRAWFIXED(), test_unicodeformat(), and test_WM_CONTEXTMENU(). Definition at line 321 of file tab.c. Definition at line 1383 of file tab.c. Definition at line 261 of file tab.c. Definition at line 304 of file tab.c. Definition at line 1484 of file tab.c. Definition at line 331 of file tab.c. Definition at line 67 of file tab.c. Definition at line 983 of file tab.c. Definition at line 1365 of file tab.c. Definition at line 598 of file tab.c. Definition at line 671 of file tab.c. Definition at line 1066 of file tab.c. Definition at line 1181 of file tab.c. Definition at line 742 of file tab.c. Definition at line 809 of file tab.c. Definition at line 952 of file tab.c. Definition at line 1000 of file tab.c. Definition at line 1115 of file tab.c. Definition at line 439 of file tab.c. Definition at line 1462 of file tab.c. Definition at line 1203 of file tab.c. Definition at line 1395 of file tab.c. Definition at line 1240 of file tab.c. Definition at line 777 of file tab.c. Definition at line 584 of file tab.c. Definition at line 1337 of file tab.c. Definition at line 1358 of file tab.c. Definition at line 182 of file tab.c. Definition at line 86 of file tab.c. 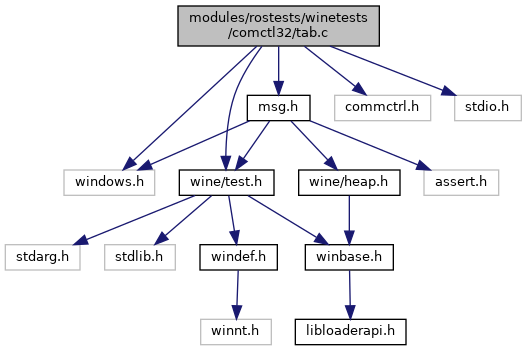 Referenced by test_curfocus(), test_cursel(), test_delete_focus(), test_extendedstyle(), test_getset_item(), test_insert_focus(), test_TCM_GETROWCOUNT(), test_TCN_SELCHANGING(), and test_unicodeformat(). Definition at line 202 of file tab.c. Definition at line 80 of file tab.c. Referenced by parent_wnd_proc(), and test_TCS_OWNERDRAWFIXED(). Definition at line 90 of file tab.c. Definition at line 95 of file tab.c. Definition at line 106 of file tab.c. Definition at line 118 of file tab.c. Definition at line 136 of file tab.c. Definition at line 155 of file tab.c. Definition at line 143 of file tab.c. Definition at line 127 of file tab.c. Definition at line 79 of file tab.c. Referenced by create_tabcontrol(), START_TEST(), TAB_DrawItemInterior(), and TAB_SetItemBounds(). Definition at line 46 of file tab.c. Definition at line 160 of file tab.c. Definition at line 43 of file tab.c. Definition at line 81 of file tab.c. Referenced by createFilledTabControl(), START_TEST(), test_adjustrect(), test_create(), test_curfocus(), test_cursel(), test_delete_focus(), test_delete_selection(), test_extendedstyle(), test_getset_item(), test_getset_tooltips(), test_insert_focus(), test_TCM_GETROWCOUNT(), test_TCM_SETITEMEXTRA(), test_TCN_SELCHANGING(), test_TCS_OWNERDRAWFIXED(), test_unicodeformat(), and test_WM_CONTEXTMENU(). Definition at line 196 of file tab.c. Definition at line 213 of file tab.c. Definition at line 208 of file tab.c. Definition at line 84 of file tab.c. Referenced by parent_wnd_proc(), START_TEST(), tab_subclass_proc(), test_curfocus(), test_cursel(), test_delete_focus(), test_extendedstyle(), test_getset_item(), test_getset_tooltips(), test_insert_focus(), test_TCM_GETROWCOUNT(), test_TCN_SELCHANGING(), test_unicodeformat(), and test_WM_CONTEXTMENU(). Definition at line 218 of file tab.c. Definition at line 82 of file tab.c. Referenced by parent_wnd_proc(), and test_TCN_SELCHANGING().